Catania combines modernity, excellent restaurants, pleasant accommodation, a spectacular fish market and great architecture. Catania was originally named Katane in the 8th century BC. It fought over power against Syracuse for 3 centuries and was badly damaged by the Romans in the 3rd century BC, then the Byzantines, the Saracens and the Normans succeeded in their power. In the 1600s Catania was already a thriving trading centre with relations with all the towns on the island. First Mount Etna erupted in 1669 taking 1200 lives and destroying the fertile lands, and then the earthquake at the end of the 17th century was the coup de grace. One year later the plans for reconstructing the town were begun. It had a different organization allowing people to easier abandon the city in case there was another eruption. The style that spread The town was rebuilt in the baroque style which was that spreading in Europe at the time. After a complete renovation the town has been restored to its former splendour of centuries ago. The shopping are is mostly around Via Pacini and Via Umberto I. 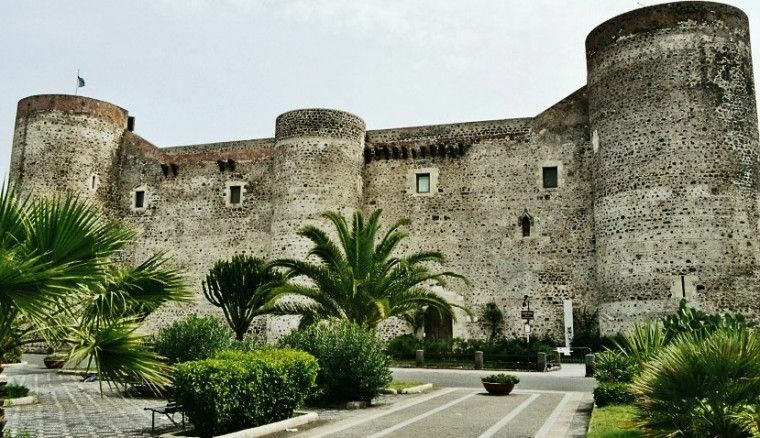 You will find the majority of Catania´s must-see sights near and to the west of Piazza del Duomo, which could not but be included on the World Heritage List. The piazza is lorded over by baroque buildings characterized by volcanic rock and limestone. The piazza is crowned by the Fontana dell’Elefante created in 1736. The fountain is a weird combination of an elephant of the Roman times that was the magician Eliodorus´ and an Egyptian obelisk. 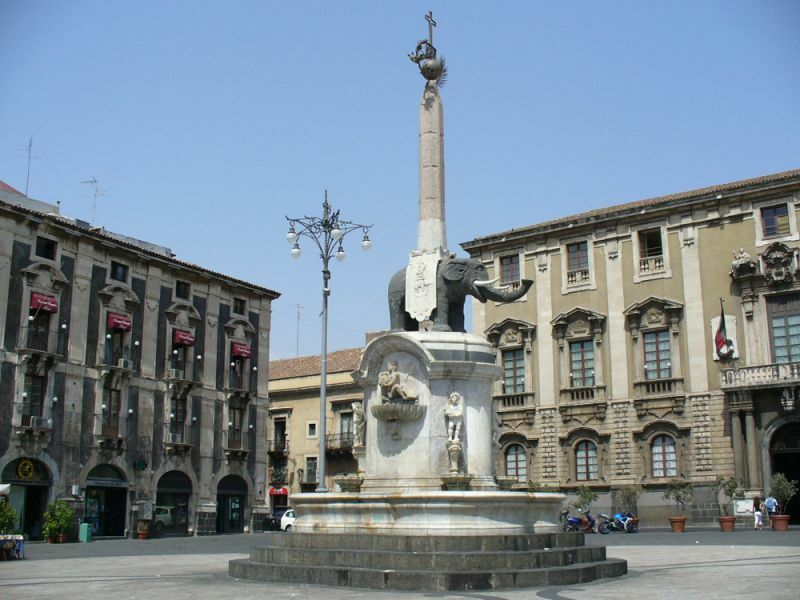 The elephant is Catania’s symbol and it is said to protect Catania from the fateful Etna. The Cathedral of Saint Agata is also believed to protect Catania from Mt Etna. The most striking features of the cathedral are its marble façade, with the towers brought from the Roman amphitheatre, the body of Sant’Agata, the patron saint of Catania, and the effigy representing her which is full of jewels. This effigy is a key part of the fiesta celebrated in her honour at the beginning of February. Also in the square is La Pescheria (the fish market) and the neighbouring food market, fun for a good browse. 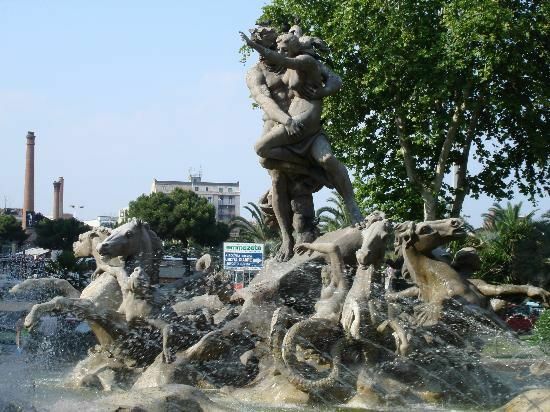 The food market is marked by the Fountain of the Amenano, created by Tito Angelini, in honour of the river whose banks were the town´s foundation site. From the Piazza del Duomo, head northeast to get to Piazza Bellini and the Teatro Massimo Bellini, both in honour of Bellini, who came from Catania and was the creator of the modern bel canto. The theatre is a magnificent building, among the largest on the continent. Nearby on Viale Africa you get to Le Ciminiere, the refurbished sulphur refinery, at present housing a cultural centre. Lapis Leaflet available at the tourist information office will inform you of all activities taking place there. The collection includes pieces of modern art and a permanent exhibition of WWII memorabilia, art and photography. Starting back at Piazza del Duomo, go past Porta Uzeda erected in 1696 towards Piazza Federico di Svevia. Here is the Castello Ursino which was originally located on a cliff and protected by a moat. After the earthquake and lava covering Catania its geography changed completely. Today it houses artefacts from the Monastery of San Nicolò and Roman artefacts in the Museo Civico. To the west of Piazza del Duomo you will find Via Crociferi. The Museo Belliniano, where Bellini used to live, is on Piazza San Francesco. It keeps some of his scores, photographs and his death mask. Chiesa di San Francesco fronts the museum. Off here is the Arco di San Benedetto constructed at the beginning of the 18th century, in just one night as the legends go. Continue past the arch and you will find the 18th century Chiesa di San Benedetto adorned with fabulous stucco and marble work. Walk past the church and near Via Crociferi are the vestiges of the Roman Theatre and the Odeon, a theatre where only rehearsals take place these days. Go back to Via Crociferi to see the curved façade of the Chiesa di San Giuliano and the excavations- an old Roman road and floor mosaics that have been unearthed. From Chiesa di San Giuliano go along Via Gesuiti which takes you to Piazza Dante and Chiesa di San Nicolò all’Arena, the biggest Sicilian church. This incomplete church is 105 m long x 48 m wide and has a cupola which reaches 62 m high. Its construction began in 1687 and was started again after being interrupted by the earthquake. It features an unattractive façade compared to the other buildings in town. The organ in the presbytery was made by Donato del Piano. Its monastery is located behind the church. This enormous building today houses part of the university. Its cloisters and library with 18th century majolica flooring are some features to notice. From Piazza del Duomo heading south and reaching the foot of Mount Etna sweeps Via Etnea, an important street lined with shops and cafes. Along it when you reach Piazza dell’Università are the Palazzo dell’Università (housing the university) and Palazzo San Giuliano. Piazza Stesicoro is a modern square with the vestiges of the Roman amphitheatre on one side. It was the second biggest after the colosseum in Rome in the 2nd century. Only looking at a diagram can you imagine how big it was. Off Piazza Stesicoro is Chiesa di Sant’Agata al Carcere where you can still see the dungeons where Sant´Agata suffered her martyrdom. Further along Via Etnea find Villa Bellini with its ravishing gardens. Classical music followers can enjoy the Catania Musica Estate in July, and Jazz enthusiasts relish the Etna Jazz festival in July. In the same month the Settimana Barocca takes place with baroque concerts and more public presentations. From the 3rd to 5th February the Festa de Sant´Agata is celebrated with displays of fireworks, and an effigy is carried through the streets to commemorate the day of their patron saint. Nightlife in Catania is abundant with lots to choose from, likelty due to the fact that it is a university town with lots of young people. Tertulia (Via Mario Rapisardi) is a bookshop-café with live music and literary gatherings. Agora Bar set in a cavern where there was a Roman bath now turned into a fabulous bar. Perbacco Wine Bar (Via Vasta) draws lots of people who enjoy the chilled atmosphere lounging on sofas and cushions under the canopy until the small hours. Completely different, calm and relaxed, at Lino’s coffee shop you can choose from its extensive list of coffees or any other drink while you read a book. Wine bar (Via Montesano) offers an endless list of Sicilian and international labels and snacks. On Via Teatro Massimo at Rendez Vous Wine Bar you may sit on the balcony or on the street. L’Insomnia, opposite Rendez Vous, is another one for those who like to stay up until the sun rises again. Heaven, on the same street, serves drinks with disco music. L’Incognito, unlike any other, takes you to a tropical place with its décor. It is on Piazza Bellini. Over Time Pub (Via Rapisardi) is prefect for drinking over a poker game at its tables. Stag’s head is also on Via rapisardi opposite Time Pub. Nievski Pub (Scalinata Alessi) is the gathering point of the followers of the alternative style. It serves Cuban and Greek dishes created with organic produce. For an Irish ambience head for Joyce, on Via Montesano, well-known, and Waxy O’Connors (opposite Joyce), for live music and dancing. For drinks and jazz head for Ixtlan (Via Teatro Massimo). Students flock to Mercati Generali, which is not in town but Internationally-recognised DJs have played here.